What to wear for engagement photos doesn’t need to be complicated. Follow these tips, and be true to your own unique style. Whatever you wear, be comfortable. Make sure you can move, sit and walk freely in your clothing and shoes. This way you can focus your energy on interacting with your partner at the shoot instead of constantly adjusting your outfit. Brent and Felicia dressed in layers for their fall pictures. They wore jeans to be comfortable and prepared for time getting dirty in the mud while we spent time playing in the sand next to the Minnesota River. If your love of nature calls for engagement pictures outside, dress in layers. In Minnesota tend to have the most beautiful, unique weather ever! Which means that you should bring a coat or sweater in fall, winter and spring just in case you need it. In summer choose light weight fabrics and plan to sweat a little. Put on bug spray to protect yourself from mosquitos. I always bring bug spray with me to our shoot. To create the best visual harmony in your engagement portraits choose one color family to go with- all pastel, or all jewel tone, or all primary colors. If you have a favorite color wear multiple shades of it instead of the exact same shade. Coordinating colors for a spring engagement shoot. Mike and Thea picked a mix of blue and grey plaid patterns that fit their casual style. Another way to create visual harmony in your photos is to wear color opposites. Many times the combination that works best will be a warm color and a cool color, like blue and yellow, or red and green. A red shirt and green dress, along with a yellow background provide contrast in this portrait. I’m a strong believer that your time together is precious. When you have portraits, I want you to enjoy yourselves and that time together. When thinking about what to wear for engagement photos, decide on what activities you will be doing, and then how you like to dress for those activities. 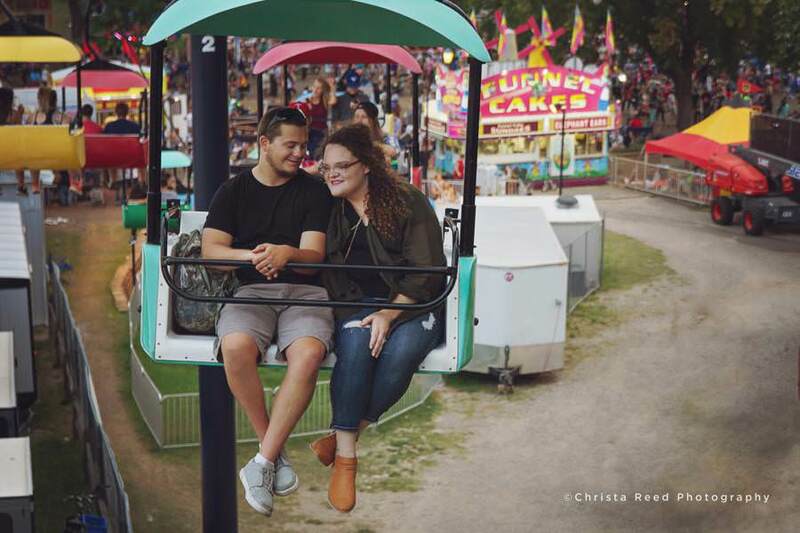 A fun date night for Mackenzie and Cody included riding the Sky Glider at the Minnesota State Fair. Let your ring be the focal point of your jewelry. Add pieces that harmonize with the ring, and don’t compete for attention. 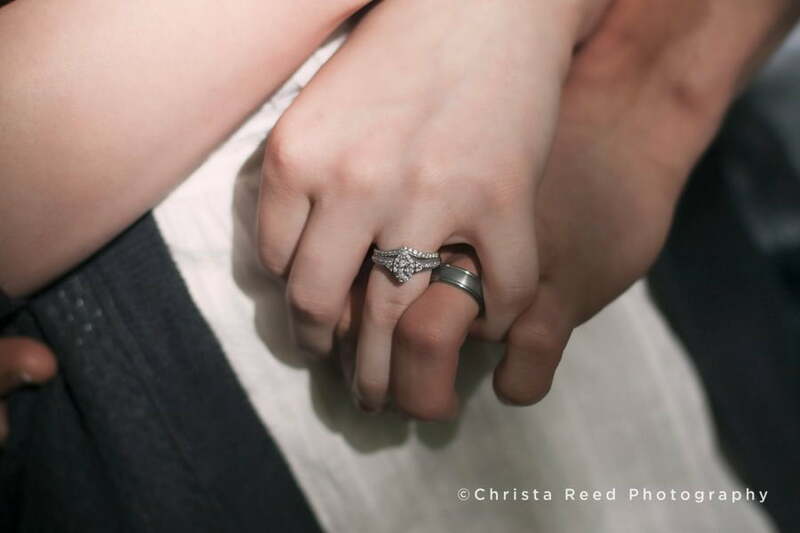 A classic ring photo from a one year anniversary shoot. With no other watches or jewelry the focus of the shot can be on those incredible rings. Should you bring the kids? Do what works best for you. 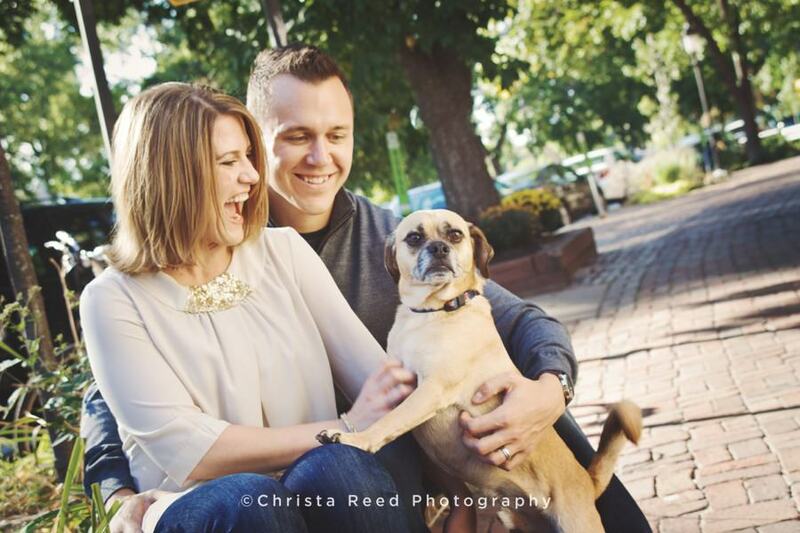 Parents can choose to have alone time at their engagement shoot. Just the two of you, a definite date night. Some couples will bring their children and celebrate their engagement as a family milestone. I’m on board with the choice that fits your family dynamic best, and when in doubt I can help you decide. If you enjoy having pictures with your pet, and your pet does well meeting new people, please bring them. I believe our animals are part of our families. Dogs, cats, birds, etc. If you love to go out and walk your dog or ride horses together, we can do that too, because your engagement shoot is about finding moments to photograph that create a portrait of your life together as a couple. When in doubt consult your photographer. 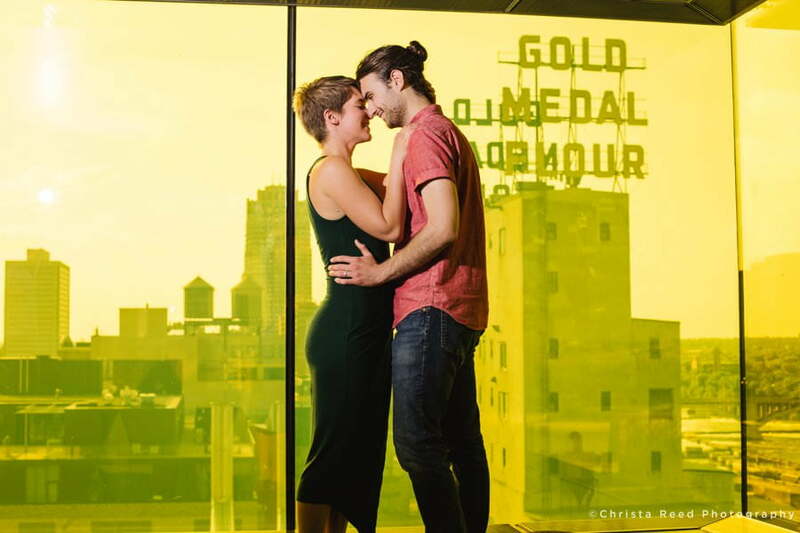 I want couples to be free to express their own style during engagement portraits. You can text me pictures, I can help you raid your closet. If you can tell me your style (casual, hipster, elegant, off beat, eclectic, etc) I can suggest outfits choices that will look great and fit your personalities. I’ll give you my opinion on your choices and show you more examples from what past couples have done with their wardrobe. Hopefully this gives you some ideas for what to wear for engagement photos. If you have questions leave me a comment or send me a message, I’m always happy to help. 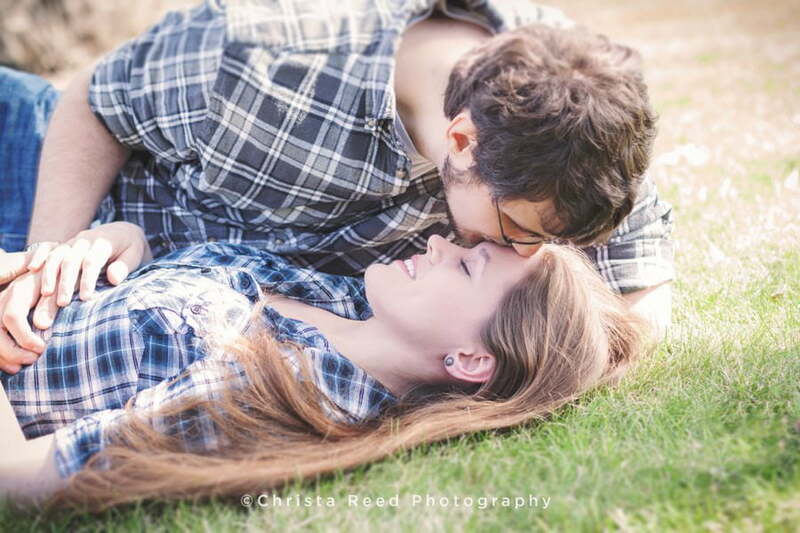 I am a Minnesota Wedding and Portrait Photographer, located in Belle Plaine. You can contact me via my contact form here. For more information on weddings and portraits, read the info page here.